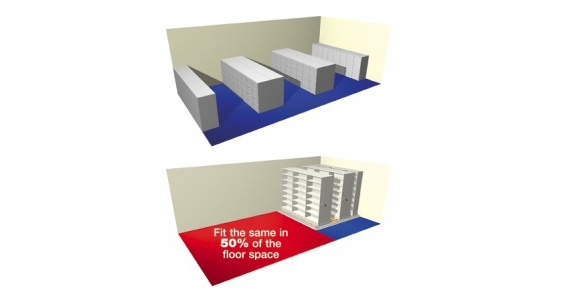 Effective storage systems are designed to provide efficient storage and retrieval. That’s why every mobile shelving system, whilst maximising the use of floor space for storage, will also give excellent accessibility to items stored. Mobile shelving is most effective in saving space, as it eliminates the need for several access aisles. Because the shelving moves along floor tracks, the space for only one aisle is needed. When an item is required the particular shelving bay is identified and an adjacent aisle is created by moving the mobile shelving units apart. Additional benefits of mobile shelving include the efficient location of items as well as security – mobile units can be closed and locked together to prevent unauthorised access. Mobile shelving is opened and closed by pull handles, hand driven mechanical systems or electric motors with push-button control. SupaglideEase of installation and relocation, as well as great aesthetics are at the heart of this system. The low profile base can accommodate a range of shelving systems to match your specific requirements, whether for bulk storage of archive material or easy access to daily office filing. The system is installed quickly and easily using pre-formed components (a grid of tracks and beams), does not require fixing to the floor and is laid directly onto existing flooring, resulting in minimal disruption to your workplace during installation. The standard floor finish is tongue and groove floor panels, providing an attractive, hard-wearing non-slip laminate finish but alternative flooring are also available. A range of end panels can be fitted to complement existing décor. A ramp edging finishes the system and allows easy access for users, even with trolleys. PowaglideOperation could not be simpler – press the button on the end panel, next to where you want an aisle to open and electric motors drive all the mobile bases aside. Smooth movement is ensured as the control system is designed to gradually increase and decrease power at the beginning and end of every operation. No special power systems are required – just plug into a standard socket and it’s ready to go. The master unit converts the supply to a safe 24 Volts DC which provides all of the power needs for the system. Battery back-up ensures the system can be operated in the event of a mains failure. The system offers an unrivalled package of safety systems as standard. Safety sweeps fitted to both sides of each aisle immediately turn off all power when they are activated. Once the aisle is clear, the system is re-activated simply by pressing the start button on any aisle. All safety systems and operating circuitry are automatically checked 30 times a second to ensure 100% correct operation. For larger shelving installations or where floor quality is variable, our range of standard mobiles comes into its own. With a choice of different types of rails and bespoke chassis sizes, these mobiles are ideal for heavier loads or for longer runs. Duraglide mobile shelving systems can accommodate a range of our shelving systems and can also be used with Longspan if high or wide load capacity is required. Various track systems can be specified – tailored to the floor conditions. This allows installation to be carried out in all types of environments – from basements to stockrooms, from laboratories to archives. The shelving can be fitted with decorative end panels to match the surrounding interior décor. This standard system can accommodate far higher loads, but can still be accessed easily by the geared manually assisted drive system. Powerglide electrical drive system can also be specified. Rollaside ShelvingRoll-aside mobile shelving is ideal in small offices or awkward shaped areas such as corridors or alcoves. Shelving is mounted on chassis and tracks and is simply rolled aside to reach the units behind.